If you just want to extract one recipe from meal suggestion it is not sraightforward to do so, as the instructions are intermingled with instructions for the rest of the meal. Still wortwhile doing for some of his ideas for vegetable accompaniments such as Jiggy Jiggy Greens and green couscous. Probably wouldn't have bought if I hadn't seen the TV tie in. We found this recipe inedible. The dressing did not taste good at all--I think it would be better with either just plain yogurt or that mixed with tamarind and coriander chutney (like a bhelpuri). Also, the flavor of the tikka paste completely disappeared after grilling. I think it would work better with a tandoori paste. We really love this recipe and make it often. The dressing is so good, that you are tempted to just spoon it up like that... A quick way to get some lovely Indian flavours into a healthy salad. Yum! Yum! Yum! Absolutely wonderful dish. I made the salsa without coriander, so it was probably more liquidy.. but still very tasty. Loved the rice/bean mix. I replaced the noodles by a mix of farro (perlato), orzo (perlato) and lentils. You can buy them in an Italian deli but any of your favorite grains will do. I cooked them in chicken stock. When the grains have absorbed almost all the liquid they will have become soft, after 25 minutes approximately,. Then drain them through a colander and let them cool down. Add to the other salad ingredients. This took me closer to 30 minutes and was fairly good but not spectacular. I find there is a bit too much couscous relative to the chicken and I also found the couscous bland. I added parsley, tripled the lemon, feta and olives and that made it better, but still not spectacular. For a start this took me longer to make than 15 mins- the family enjoyed it but I found the couscous a little bland- despite having an assortment of nice things added to it-however it was extremely colourful. Fine for a weeknight meal but nothing special and I probably wouldn't repeat it. I agree that the couscous alone is bland. I really loved this! It took about 20-25 minutes to make (after getting everything that I needed laid out). My big American chicken thighs were probably twice the size of Jamie's so they took a bit longer to cook. Great SE Asian flavor super fast! The chicken portion of this dish is so easy and tasty. One of my favorite things to make when I'm in a rush. Excellent recipe, took me quite a bit longer than 15 minutes but I wasn't in much of a rush. Very flavourful laksa, and the chicken was delicious. I subbed green beans for the asparagus otherwise stuck to the recipe. Will definitely be making this again, the family loved it. I made this tonight for my family. I used skin & boneless chicken thighs, a can of regular lentils and a slug of white wine as I had an open bottle next to me. Very tasty, and the child even ate the lentils with no fuss! Saturday April 26, 2014 Made using lamb sirloin and ordinary canned lentils as couldn't get puy - it was really good. We are in the middle of kitchen renos and so I had to cook on a two-ring camping stove!! My family really enjoyed this but I felt the meatballs need more oomph, possibly some cayenne and ground cumin. Also took me a lot longer than 15 minutes but still a quick easy and tasty dinner. Will repeat. The burgers were really delicious. They were only flavored with a swig of ale and a teaspoon of whole grain mustard (for me, Creole mustard), but they packed so much flavor. I didn't see any instructions to season with salt and pepper, but obviously I did. As for the sauce (blandly sour) and the salad (too sweet), I didn't care for either. I would make the burgers again, but just sub my own seasonal side salad. Super good! These burgers are so quick to make. I preferred white wine vinegar in the salad dressing instead of red wine vinegar. Not so much on this one for us. The combination of sweet gherkins and parsley was very odd I thought, plus there is barely enough yogurt and milk to coat the beef which makes this for a fairly dry dish. If your goal is speed and you have some beef I don't see why you wouldn't just make a steak and salad, this results in an herbaceous creamy mess. I also used canned lentils and increased the meatball ingredients by 50% to feed four hungry fellows and a baby. I thought the the short cooking of the sauce made for a nice fresh flavor but it still had good depth. Overall very easy, quick, and satisfying. I substituted the ready-to-eat pack of lentils with 250g of well-drained, lightly mashed, canned lentils. Koftas were moist but stayed intact and didn't fall apart. (From Series 1, Episode 32 of the TV show). Charring the courgette and aubergine on a dry grilling pan is a great move; no excess moisture in the ratatouille, which so often makes this dish rather bland. Also loved the saffrony lemony rice. The whole thing feels quite luxurious despite the simple ingredients. Good dinner party food if you want something easy! We are fans of the mushroom sauce. We often vary with the vegetables, depending on the season. This was an ok dinner. The best part was the zucchini, which picked up the flavors of the ham (I used speck) in addition to the chile and the mint and was amazing. I had issues with the timing of the cook on the pork, possibly because I used pork loin and not tenderloin. I didn't care that much for the swipe of sundried tomato paste and lemon through the rice (I used regular brown rice) and wouldn't use it again. This dish taught me that pork belly doesn't only work as a braise, but that sautéing works great too. It's a nice quick shortcut for a weeknight taco craving. I agree that the sauce is lovely and overall this is a very nice, healthy meal with fresh flavours. My only drawback is, as with many of these recipes, that although the prep is fairly fast, the amount of washing up it creates (pan for the sauce, pan for the pork, pan for the rice, food processor, etc.) is quite a lot for what is supposed to be a quick midweek meal! Pg 94. The Hungarian Pepper Sauce is really lovely, I made mine in advance and reheated it later and it was still vibrant and peppers not overcooked. As I'm a veggie I used a Portobello Mushroom in place of the Pork (my Husband had the pork though!). I really enjoyed this. It took about 30 minutes to get everything together but was flavorful and filling and felt like I had spent significantly longer. The garam masala was effective at flavoring the meatballs quickly but I wouldn't bother with the saffron next time because it's flavor didn't come through in the sauce to justify using such a pricy ingredient. My ground lamb was very fatty and I chose to remove the fat from the pan before adding the meatballs to the sauce. Pita bread or Turkish bread would be equally good with this recipe. Nice flavour! A lot less to eat than in most of the other recipes in the book. Cooked this for my husband who thought it is one of the best meals he has ever eaten! Salmon was easy to cook even for a first timer like me and I did make the salmon skin crisps as well. Left out coriander. Easy to prepare, flavorful dish. I used smoked mackerel instead of cod, which gave it a stronger flavor but it was not too overpowering. This is a winner. I cheated and used lazy lemongrass and ginger, and swapped out the squid for salmon chunks, which I added straight to the broth at the same time as the noddles. The broth itself is so easy and quick, packed in plenty of flavour and I loved the way Jamie has you slice the veg in the food processor. This is one I will make over and over again. Very tasty. Felt that more prawns were needed than recipe stated, I used 500g.the slicing blade on my food processor worked perfectly as per instructions. It's a great dish for a really hot day. The bread goes rather soggy adding it first after the liquid. If you'd prefer it crunchier, add it last. Another tasty dish. Will make again. This is always a winner in our house. Very easy and the chicken tastes delicious with all the herbs and the juices from the cherry tomatoes. Great and easy recipe for a weeknight. I already had my own pesto made, so just used that instead, which made the prep even faster. The chicken was very flavorful and very fast! I agree about adding more tomatoes. A delicious dish!!! I used peas instead of beans and would definitely add more tomatoes next time. Do not use hot english mustard... use dijon or wholegrain. Lovely meal! Chorizo just is so good. I really loved this salad, too, especially the nice cold clementine slices. Very nice- a satisfying midweek meal, which is subtly spiced and well rounded. And it’s easily achieved within 15 minutes. I’ll make this again. Only made the carbonara part of the recipe, which we found turned out rather odd. It had a weird tangy taste to it - was it the yoghurt or the lemon juice, or maybe a combination of the two? Possibly the chilli wasn't quite right in there? The dish was certainly easy to make and not inedible, so might try again substituting the yoghurt with other dairy products and reducing the amount of lemon juice. This is absolutely delicious and great for a midweek dinner, definitely worth repeating. This was a good quick dinner that packed quite a few vegetables into a basic pasta dish and seems to be pretty flexible in terms of veg and herbs used. (I would think you could make several types of variations based on what is on hand and your preference.) The vegetables really cook down into the sauce. I subbed red pepper flakes for the chili since I didn't have one, used an orange bell pepper instead of jarred roasted peppers, and couldn't find the pine nuts so omitted them. This was only so-so for us. I agree with the reviewer who stated she didn't like it because there was too much of a tomato flavour. I personally love a good tomato sauce but using the jarred passata that is only augmented by the micro minced mixed vegetables made for a very boring sauce. I also found that the thyme and the rosemary didn't work well with each other or the balsamic. On the whole this was really quite unimpressive. Plus as per usual with this book I didn't manage anything close to 15 minutes and you end up with two pots and a pan to wash after you are done cooking. I usually like Jamie's flavours but this recipe not so much and not so quick. I like it that Jamie's pasta dishes are easy to make, but I didn't really like the flavour of this dish. I must say though that I don't really like anything too tomatoey. I liked this and my kids loved it (NB I modified the recipe) which means I'll probably make it again as it's a good healthy family meal. I felt there were rather a lot of ingredients and I didn't have/use them all but rather modified the recipe to suit me. I didn't have any courgettes or bacon and used tinned tomatoes in place of passata. I also left out the basalmic vinegar, chillis and pine nuts to simplify and make it more child-friendly. Wonderful pasta dish. Very easy because you cook the pasta and broccoli in the same pan. And you make the dressing in the blender. The dressing gives the dish a real kick because of the anchovy and lemon. I could eat this every week! An easy 15 minute dish. I was halving the recipe so subtituted a 250g jar of Mexican medium hot chilli salsa (which I blitzed to a sauce) in place of passata and chilli. The garlic crumbs add a nice textural crunch. The fennel/celery/mint salad was OK but nothing "special" - but it did clear out the veg drawer, which was a goal! Came back to this recipe: now retract my view on the salad. This time the pasta was great, and the salad was very tasty .. maybe it depends on the fennel? Or have my taste buds changed over 5 years! Delicious!! Made with a simple green salad instead of the shaved fennel salad. Would have almost been possible to finish in 15 minutes, but I let the sauce simmer fo an additional 15 minutes to thicken it more before adding the prawns. Will make again. Another meal where all the different components make the most amazing tasting dish when put together. That spicy yoghurt sauce is amazing! and nachos are the perfect addition to this. I found the soup needed an extra stock cube to boost its flavour (although I did replace some of the carrots with frozen cauliflower as I only had one, so perhaps that was why). Together with the pancetta (I used streaky bacon), dumplings and crispy sage it made a lovely meal; add some bread alongside and I found it filling enough to have for dinner. This was surprisingly nice. Made half the soup recipe but full dumplings for 2. I had a notion to make this for breakfast one morning when I was pretty hungover and it didn't disappoint. (And thankfully it was no hassle to put together.) I omitted the cress and made a few substitutions: leftover roast chicken for raw chicken breasts, smoked lardons for pancetta, jalapenoes for pickled chillies, and mixed crispy salad for little gem. The only change I'd make in future would be to leave the spring onion out of the guacamole mix, as I found it a little too oniony. As often with Jamie Oliver recipes you can cut back on the oil a little. Lovely combination of indulgence (soft bread, bacon) with freshness (salad, radishes, guac). This is soooo yummie! It's worth the effort to put in all the (many) ingredients because they really work well together. Important to use good quality bread. Just takes a bit longer than 15 minutes (as always with this book). Jamie really does know how to make tasty food! I definitely don't often eat vegetarian food, but this was lovely. I especially like the salad with lots of mint. Page 236 in UK edition. This was a really beautiful dish, a great mix of sour, bitter, sweet, crunch, warm, cold, and healthy too - YUM! What a tasty meal. Tomato salad is quite spicy, but when you have it together with the lentils, natural yoghurt and the naan... omg, so good!!! Was not impressed, edible but not worth doing. Super delicious!!! My batter sat for a while and got thicker, so my pancakes were thicker, too. I only used half a chilli as I was nervous there would be too much heat, but I will definitely use a whole one next time. Left out coriander as I can't stand it. I think my pears weren't ripe enough as it was a bit hard going getting everything blended and the smoothie was VERY thick. Had to add quite a bit more apple juice. This was a lot more delicious than I had expected by just looking at the list of ingredients. Very quick and easy to make. It was a very herby pasta sauce having such strong herbs in it - fennel seeds and fresh rosemary. It was rich and warm which was perfect for our Saturday night in. 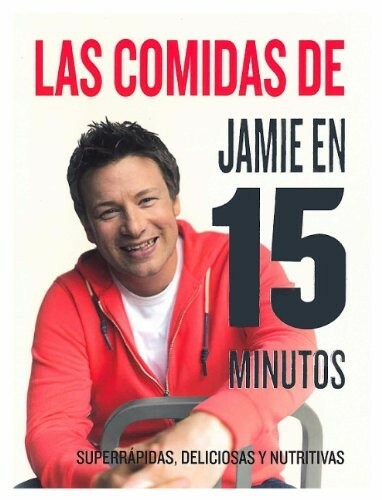 Following the record-breaking success of "30-Minute Meals", Britain's most-popular cookbook of all time, Jamie Oliver brings us the even-better "15-Minute Meals". This book is completely devoted to what we are asking for - super quick, tasty, nutritious food that you can eat everyday of the week. In creating these recipes Jamie's made sure they're methodical, clever, sociable, fun, with beautiful food full of big flavours. It's a classic book that will arm you with the skills to create wonderful meals, shockingly fast. He's taken inspiration from all over the world, embracing the tastes that we all love, playing on classic chicken, steak and pasta dishes, looking at Asian-inspired street food and brilliant Moroccan flavours, putting together great salads and so much more. And these are some of the quickest and easiest meals Jamie's ever done. These recipes have been tested and tested to ensure that this book is a reliable companion for you and your family. "Jamie Oliver's 15-Minute Meals" is far and away the most balanced and exciting everyday cookbook out there - and if you liked 30-Minute Meals, this will knock your socks off.